If you're on the lookout for a casual yet stylish outfit, consider wearing a black coat and charcoal ripped skinny jeans. Both garments are totally comfy and will look fabulous together. For shoes, go down the classic route with dark brown leather ankle boots. If you're hunting for a casual yet stylish ensemble, pair a black coat with black chinos. Both pieces are totally comfy and will look fabulous together. If you're scouting for a casual yet chic outfit, marry a Kristen Blake double breasted long wool coat with black leather skinny jeans. Both garments are totally comfy and will look fabulous paired together. When it comes to shoes, this look is complemented wonderfully with black leather tassel loafers. If you're on the hunt for a casual yet absolutely chic getup, choose a black coat and blue horizontal striped jeans. Both garments are totally comfy and will look fabulous together. Break up your getup with more casual footwear, such as this pair of white low top sneakers. If you're scouting for a casual yet totally chic look, consider wearing a Kristen Blake double breasted long wool coat and brown check tapered pants. Both items are totally comfy and will look fabulous paired together. A pair of black leather ankle boots will seamlessly integrate within a variety of combos. If you're scouting for a casual yet stylish getup, make a Kristen Blake double breasted long wool coat and black skinny jeans your outfit choice. Both items are totally comfy and will look fabulous together. For something more on the daring side to complete this ensemble, rock a pair of brown leather lace-up flat boots. If you're after a casual yet stylish outfit, wear a Kristen Blake double breasted long wool coat from Nordstrom with a silver sweater dress. Both pieces are totally comfy and will look fabulous together. When it comes to footwear, this look is finished off nicely with black leather ankle boots. 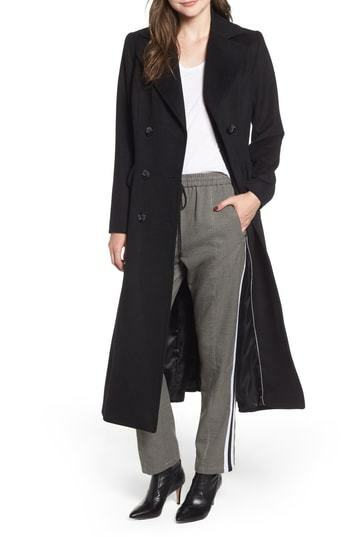 If you're on the lookout for a casual yet absolutely chic outfit, try teaming a Kristen Blake double breasted long wool coat from Nordstrom with black floral sweatpants. Both pieces are totally comfy and will look fabulous paired together. Lift up your getup with black leather ankle boots. If you're on the hunt for a casual yet chic ensemble, team a Kristen Blake double breasted long wool coat with blue ripped skinny jeans. Both garments are totally comfy and will look fabulous paired together. Make tan suede ankle boots your footwear choice to instantly up the chic factor of any outfit.